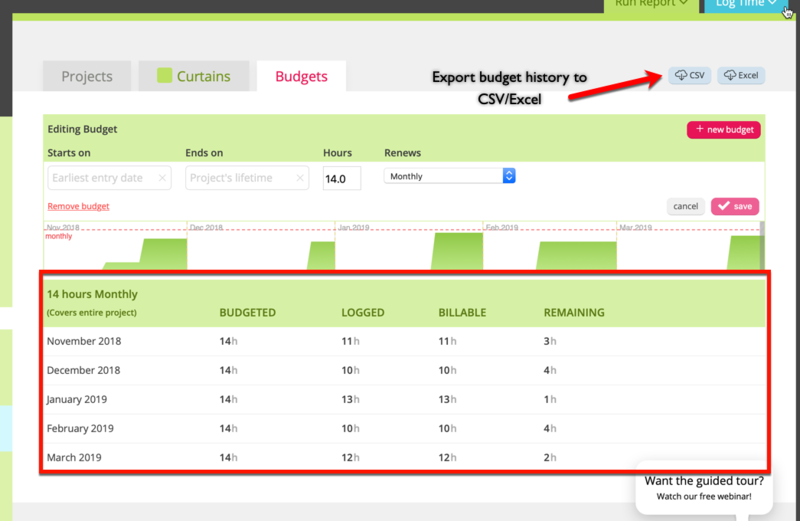 If you've configured a budget for your project, you can view your progress and set a budget alert so you never go over budget again! Next to each project in Noko is a little gray circle. When the circle is gray, it means that no budget has been set for that particular project. If you mouse over the little gray circle Noko will ask if you want to set a budget. Once you've set a budget for your project, the little gray circle conveniently becomes a little progress indicator. You'll be able to see at a glance how far along you are in your project based on the budget you've set, and if you mouse over the circle, Noko will tell you how many hours are left in your budget. You can also view your project's progress by clicking on the project name and going to the individual project's page. Here you'll find a breakdown of the time you've logged, how many hours are budgeted for the project, and how many hours are left in the project budget, as well as a progress indicator of where you are in the project based on the budget you've set. Use the graph to look at the details on when the project was worked on. Need to extend a budget or add a few hours? You can edit any budget by hovering over it on the budget graph and clicking the section. This will update the form so you can quickly update the budget and get back to work! By default, a project's budget lasts the entire lifetime of the project. But sometimes a project involves multiple budgets over time, and you want to keep a history of them! Whenever you're setting or editing a budget, you can change the "Starts on" and "Ends on" date of the budget. Existing budgets will automatically be adjusted so the new budget can fit in, and you can see the changes in the graph preview under the form. Do you need your budget to repeat every week or month? Set up a recurring budget.